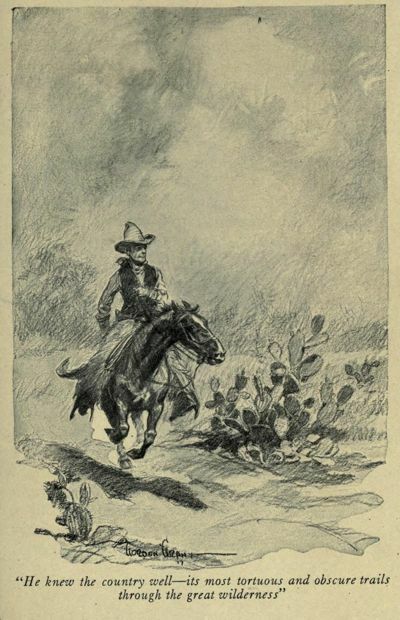 The trouble began in Laredo. It was the Llano Kid's fault, for he should have confined his habit of manslaughter to Mexicans. But the Kid was past twenty; and to have only Mexicans to one's credit at twenty is to blush unseen on the Rio Grande border. It happened in old Justo Valdos's gambling house. There was a poker game at which sat players who were not all friends, as happens often where men ride in from afar to shoot Folly as she gallops. There was a row over so small a matter as a pair of queens; and when the smoke had cleared away it was found that the Kid had committed an indiscretion, and his adversary had been guilty of a blunder. For, the unfortunate combatant, instead of being a Greaser, was a high-blooded youth from the cow ranches, of about the Kid's own age and possessed of friends and champions. His blunder in missing the Kid's right ear only a sixteenth of an inch when he pulled his gun did not lessen the indiscretion of the better marksman. The Kid, not being equipped with a retinue, nor bountifully supplied with personal admirers and supporters--on account of a rather umbrageous reputation, even for the border--considered it not incompatible with his indispensable gameness to perform that judicious tractional act known as "pulling his freight." Quickly the avengers gathered and sought him. Three of them overtook him within a rod of the station. The Kid turned and showed his teeth in that brilliant but mirthless smile that usually preceded his deeds of insolence and violence, and his pursuers fell back without making it necessary for him even to reach for his weapon. But in this affair the Kid had not felt the grim thirst for encounter that usually urged him on to battle. It had been a purely chance row, born of the cards and certain epithets impossible for a gentleman to brook that had passed between the two. The Kid had rather liked the slim, haughty, brown-faced young chap whom his bullet had cut off in the first pride of manhood. And now he wanted no more blood. He wanted to get away and have a good long sleep somewhere in the sun on the mesquit grass with his handkerchief over his face. Even a Mexican might have crossed his path in safety while he was in this mood. The Kid openly boarded the north-bound passenger train that departed five minutes later. But at Webb, a few miles out, where it was flagged to take on a traveller, he abandoned that manner of escape. There were telegraph stations ahead; and the Kid looked askance at electricity and steam. Saddle and spur were his rocks of safety. The man whom he had shot was a stranger to him. But the Kid knew that he was of the Coralitos outfit from Hidalgo; and that the punchers from that ranch were more relentless and vengeful than Kentucky feudists when wrong or harm was done to one of them. So, with the wisdom that has characterized many great farmers, the Kid decided to pile up as many leagues as possible of chaparral and pear between himself and the retaliation of the Coralitos bunch. Near the station was a store; and near the store, scattered among the mesquits and elms, stood the saddled horses of the customers. Most of them waited, half asleep, with sagging limbs and drooping heads. But one, a long-legged roan with a curved neck, snorted and pawed the turf. Him the Kid mounted, gripped with his knees, and slapped gently with the owner's own quirt. If the slaying of the temerarious card-player had cast a cloud over the Kid's standing as a good and true citizen, this last act of his veiled his figure in the darkest shadows of disrepute. On the Rio Grande border if you take a man's life you sometimes take trash; but if you take his horse, you take a thing the loss of which renders him poor, indeed, and which enriches you not--if you are caught. For the Kid there was no turning back now. With the springing roan under him he felt little care or uneasiness. After a five-mile gallop he drew it in to the plainsman's jogging trot, and rode northeastward toward the Nueces River bottoms. He knew the country well--its most tortuous and obscure trails through the great wilderness of brush and pear, and its camps and lonesome ranches where one might find safe entertainment. Always he bore to the east; for the Kid had never seen the ocean, and he had a fancy to lay his hand upon the mane of the great Gulf, the gamesome colt of the greater waters. So after three days he stood on the shore at Corpus Christi, and looked out across the gentle ripples of a quiet sea. Captain Boone, of the schooner /Flyaway/, stood near his skiff, which one of his crew was guarding in the surf. When ready to sail he had discovered that one of the necessaries of life, in the parallelogrammatic shape of plug tobacco, had been forgotten. A sailor had been dispatched for the missing cargo. Meanwhile the captain paced the sands, chewing profanely at his pocket store. A slim, wiry youth in high-heeled boots came down to the water's edge. His face was boyish, but with a premature severity that hinted at a man's experience. His complexion was naturally dark; and the sun and wind of an outdoor life had burned it to a coffee brown. His hair was as black and straight as an Indian's; his face had not yet upturned to the humiliation of a razor; his eyes were a cold and steady blue. He carried his left arm somewhat away from his body, for pearl-handled .45s are frowned upon by town marshals, and are a little bulky when placed in the left armhole of one's vest. He looked beyond Captain Boone at the gulf with the impersonal and expressionless dignity of a Chinese emperor. "Thinkin' of buyin' that'ar gulf, buddy?" asked the captain, made sarcastic by his narrow escape from a tobaccoless voyage. "Why, no," said the Kid gently, "I reckon not. I never saw it before. I was just looking at it. Not thinking of selling it, are you?" "Not this trip," said the captain. "I'll send it to you C.O.D. when I get back to Buenas Tierras. Here comes that capstanfooted lubber with the chewin'. I ought to've weighed anchor an hour ago." "Is that your ship out there?" asked the Kid. "Why, yes," answered the captain, "if you want to call a schooner a ship, and I don't mind lyin'. But you better say Miller and Gonzales, owners, and ordinary plain, Billy-be-damned old Samuel K. Boone, skipper." "Where are you going to?" asked the refugee. "Buenas Tierras, coast of South America--I forgot what they called the country the last time I was there. Cargo--lumber, corrugated iron, and machetes." "What kind of a country is it?" asked the Kid--"hot or cold?" "Warmish, buddy," said the captain. "But a regular Paradise Lost for elegance of scenery and be-yooty of geography. Ye're wakened every morning by the sweet singin' of red birds with seven purple tails, and the sighin' of breezes in the posies and roses. And the inhabitants never work, for they can reach out and pick steamer baskets of the choicest hothouse fruit without gettin' out of bed. And there's no Sunday and no ice and no rent and no troubles and no use and no nothin'. It's a great country for a man to go to sleep with, and wait for somethin' to turn up. The bananys and oranges and hurricanes and pineapples that ye eat comes from there." "That sounds to me!" said the Kid, at last betraying interest. "What'll the expressage be to take me out there with you?" "Twenty-four dollars," said Captain Boone; "grub and transportation. Second cabin. I haven't got a first cabin." "You've got my company," said the Kid, pulling out a buckskin bag. With three hundred dollars he had gone to Laredo for his regular "blowout." The duel in Valdos's had cut short his season of hilarity, but it had left him with nearly $200 for aid in the flight that it had made necessary. "All right, buddy," said the captain. "I hope your ma won't blame me for this little childish escapade of yours." He beckoned to one of the boat's crew. "Let Sanchez lift you out to the skiff so you won't get your feet wet." Thacker, the United States consul at Buenas Tierras, was not yet drunk. It was only eleven o'clock; and he never arrived at his desired state of beatitude--a state wherein he sang ancient maudlin vaudeville songs and pelted his screaming parrot with banana peels--until the middle of the afternoon. So, when he looked up from his hammock at the sound of a slight cough, and saw the Kid standing in the door of the consulate, he was still in a condition to extend the hospitality and courtesy due from the representative of a great nation. "Don't disturb yourself," said the Kid, easily. "I just dropped in. They told me it was customary to light at your camp before starting in to round up the town. I just came in on a ship from Texas." "Glad to see you, Mr.--" said the consul. "Sprague Dalton," he said. "It sounds funny to me to hear it. I'm called the Llano Kid in the Rio Grande country." "I'm Thacker," said the consul. "Take that cane-bottom chair. Now if you've come to invest, you want somebody to advise you. These dingies will cheat you out of the gold in your teeth if you don't understand their ways. Try a cigar?" "Much obliged," said the Kid, "but if it wasn't for my corn shucks and the little bag in my back pocket I couldn't live a minute." He took out his "makings," and rolled a cigarette. "They speak Spanish here," said the consul. "You'll need an interpreter. If there's anything I can do, why, I'd be delighted. If you're buying fruit lands or looking for a concession of any sort, you'll want somebody who knows the ropes to look out for you." "I speak Spanish," said the Kid, "about nine times better than I do English. Everybody speaks it on the range where I come from. And I'm not in the market for anything." "You speak Spanish?" said Thacker thoughtfully. He regarded the kid absorbedly. "You look like a Spaniard, too," he continued. "And you're from Texas. And you can't be more than twenty or twenty-one. I wonder if you've got any nerve." "You got a deal of some kind to put through?" asked the Texan, with unexpected shrewdness. "Are you open to a proposition?" said Thacker. "What's the use to deny it?" said the Kid. "I got into a little gun frolic down in Laredo and plugged a white man. There wasn't any Mexican handy. And I come down to your parrot-and-monkey range just for to smell the morning-glories and marigolds. Now, do you /sabe/?" "Let me see your hand," he said. He took the Kid's left hand, and examined the back of it closely. "I can do it," he said excitedly. "Your flesh is as hard as wood and as healthy as a baby's. It will heal in a week." "If it's a fist fight you want to back me for," said the Kid, "don't put your money up yet. Make it gun work, and I'll keep you company. But no barehanded scrapping, like ladies at a tea-party, for me." "It's easier than that," said Thacker. "Just step here, will you?" Through the window he pointed to a two-story white-stuccoed house with wide galleries rising amid the deep-green tropical foliage on a wooded hill that sloped gently from the sea. "In that house," said Thacker, "a fine old Castilian gentleman and his wife are yearning to gather you into their arms and fill your pockets with money. Old Santos Urique lives there. He owns half the gold-mines in the country." "You haven't been eating loco weed, have you?" asked the Kid. "Sit down again," said Thacker, "and I'll tell you. Twelve years ago they lost a kid. No, he didn't die--although most of 'em here do from drinking the surface water. He was a wild little devil, even if he wasn't but eight years old. Everybody knows about it. Some Americans who were through here prospecting for gold had letters to Senor Urique, and the boy was a favorite with them. They filled his head with big stories about the States; and about a month after they left, the kid disappeared, too. He was supposed to have stowed himself away among the banana bunches on a fruit steamer, and gone to New Orleans. He was seen once afterward in Texas, it was thought, but they never heard anything more of him. Old Urique has spent thousands of dollars having him looked for. The madam was broken up worst of all. The kid was her life. She wears mourning yet. But they say she believes he'll come back to her some day, and never gives up hope. On the back of the boy's left hand was tattooed a flying eagle carrying a spear in his claws. That's old Urique's coat of arms or something that he inherited in Spain." The Kid raised his left hand slowly and gazed at it curiously. "That's it," said Thacker, reaching behind the official desk for his bottle of smuggled brandy. "You're not so slow. I can do it. What was I consul at Sandakan for? I never knew till now. In a week I'll have the eagle bird with the frog-sticker blended in so you'd think you were born with it. I brought a set of the needles and ink just because I was sure you'd drop in some day, Mr. Dalton." "Oh, hell," said the Kid. "I thought I told you my name!" "All right, 'Kid,' then. It won't be that long. How does Senorito Urique sound, for a change?" "I never played son any that I remember of," said the Kid. "If I had any parents to mention they went over the divide about the time I gave my first bleat. What is the plan of your round-up?" Thacker leaned back against the wall and held his glass up to the light. "We've come now," said he, "to the question of how far you're willing to go in a little matter of the sort." "I told you why I came down here," said the Kid simply. "A good answer," said the consul. "But you won't have to go that far. Here's the scheme. After I get the trademark tattooed on your hand I'll notify old Urique. In the meantime I'll furnish you with all of the family history I can find out, so you can be studying up points to talk about. You've got the looks, you speak the Spanish, you know the facts, you can tell about Texas, you've got the tattoo mark. When I notify them that the rightful heir has returned and is waiting to know whether he will be received and pardoned, what will happen? They'll simply rush down here and fall on your neck, and the curtain goes down for refreshments and a stroll in the lobby." "I'm waiting," said the Kid. "I haven't had my saddle off in your camp long, pardner, and I never met you before; but if you intend to let it go at a parental blessing, why, I'm mistaken in my man, that's all." "Thanks," said the consul. "I haven't met anybody in a long time that keeps up with an argument as well as you do. The rest of it is simple. If they take you in only for a while it's long enough. Don't give 'em time to hunt up the strawberry mark on your left shoulder. Old Urique keeps anywhere from $50,000 to $100,000 in his house all the time in a little safe that you could open with a shoe buttoner. Get it. My skill as a tattooer is worth half the boddle. We go halves and catch a tramp steamer for Rio Janeiro. Let the United States go to pieces if it can't get along without my services. /Que dice, senor/?" "It sounds to me!" said the Kid, nodding his head. "I'm out for the dust." "All right, then," said Thacker. "You'll have to keep close until we get the bird on you. You can live in the back room here. I do my own cooking, and I'll make you as comfortable as a parsimonious Government will allow me." Half an hour afterward--quick time for Buenas Tierras--Senor Urique's ancient landau drove to the consul's door, with the barefooted coachman beating and shouting at the team of fat, awkward horses. A tall man with a white moustache alighted, and assisted to the ground a lady who was dressed and veiled in unrelieved black. The two hastened inside, and were met by Thacker with his best diplomatic bow. By his desk stood a slender young man with clear-cut, sun-browned features and smoothly brushed black hair. Senora Urique threw back her black veil with a quick gesture. She was past middle age, and her hair was beginning to silver, but her full, proud figure and clear olive skin retained traces of the beauty peculiar to the Basque province. But, once you had seen her eyes, and comprehended the great sadness that was revealed in their deep shadows and hopeless expression, you saw that the woman lived only in some memory. She bent upon the young man a long look of the most agonized questioning. Then her great black eyes turned, and her gaze rested upon his left hand. And then with a sob, not loud, but seeming to shake the room, she cried "/Hijo mio/!" and caught the Llano Kid to her heart. A month afterward the Kid came to the consulate in response to a message sent by Thacker. He looked the young Spanish /caballero/. His clothes were imported, and the wiles of the jewellers had not been spent upon him in vain. A more than respectable diamond shone on his finger as he rolled a shuck cigarette. "Nothing much," said the Kid calmly. "I eat my first iguana steak to-day. They're them big lizards, you /sabe/? I reckon, though, that frijoles and side bacon would do me about as well. Do you care for iguanas, Thacker?" "No, nor for some other kinds of reptiles," said Thacker. It was three in the afternoon, and in another hour he would be in his state of beatitude. "It's time you were making good, sonny," he went on, with an ugly look on his reddened face. "You're not playing up to me square. You've been the prodigal son for four weeks now, and you could have had veal for every meal on a gold dish if you'd wanted it. Now, Mr. Kid, do you think it's right to leave me out so long on a husk diet? What's the trouble? Don't you get your filial eyes on anything that looks like cash in the Casa Blanca? Don't tell me you don't. Everybody knows where old Urique keeps his stuff. It's U.S. currency, too; he don't accept anything else. What's doing? Don't say 'nothing' this time." "Why, sure," said the Kid, admiring his diamond, "there's plenty of money up there. I'm no judge of collateral in bunches, but I will undertake for to say that I've seen the rise of $50,000 at a time in that tin grub box that my adopted father calls his safe. And he lets me carry the key sometimes just to show me that he knows I'm the real Francisco that strayed from the herd a long time ago." "Well, what are you waiting for?" asked Thacker, angrily. "Don't you forget that I can upset your apple-cart any day I want to. If old Urique knew you were an imposter, what sort of things would happen to you? Oh, you don't know this country, Mr. Texas Kid. The laws here have got mustard spread between 'em. These people here'd stretch you out like a frog that had been stepped on, and give you about fifty sticks at every corner of the plaza. And they'd wear every stick out, too. What was left of you they'd feed to alligators." "I might just as well tell you now, pardner," said the Kid, sliding down low on his steamer chair, "that things are going to stay just as they are. They're about right now." "What do you mean?" asked Thacker, rattling the bottom of his glass on his desk. "The scheme's off," said the Kid. "And whenever you have the pleasure of speaking to me address me as Don Francisco Urique. I'll guarantee I'll answer to it. We'll let Colonel Urique keep his money. His little tin safe is as good as the time-locker in the First National Bank of Laredo as far as you and me are concerned." "You're going to throw me down, then, are you?" said the consul. "Sure," said the Kid cheerfully. "Throw you down. That's it. And now I'll tell you why. The first night I was up at the colonel's house they introduced me to a bedroom. No blankets on the floor--a real room, with a bed and things in it. And before I was asleep, in comes this artificial mother and tucks in the covers. 'Panchito,' she says, 'my little lost one, God has brought you back to me. I bless His name forever.' It was that, or some truck like that, she said. And down comes a drop or two of rain and hits me on the nose. And all that stuck by me, Mr. Thacker. And it's been that way ever since. And it's got to stay that way. Don't you think that it's for what's in it for me, either, that I say so. If you have any such ideas, keep 'em to yourself. I haven't had much truck with women in my life, and no mothers to speak of, but here's a lady that we've got to keep fooled. Once she stood it; twice she won't. I'm a low-down wolf, and the devil may have sent me on this trail instead of God, but I'll travel it to the end. And now, don't forget that I'm Don Francisco Urique whenever you happen to mention my name." "I'll expose you to-day, you--you double-dyed traitor," stammered Thacker. The Kid arose and, without violence, took Thacker by the throat with a hand of steel, and shoved him slowly into a corner. Then he drew from under his left arm his pearl-handled .45 and poked the cold muzzle of it against the consul's mouth. "I told you why I come here," he said, with his old freezing smile. "If I leave here, you'll be the reason. Never forget it, pardner. Now, what is my name?" "Er--Don Francisco Urique," gasped Thacker. From outside came a sound of wheels, and the shouting of some one, and the sharp thwacks of a wooden whipstock upon the backs of fat horses. The Kid put up his gun, and walked toward the door. But he turned again and came back to the trembling Thacker, and held up his left hand with its back toward the consul. "There's one more reason," he said slowly, "why things have got to stand as they are. The fellow I killed in Laredo had one of them same pictures on his left hand." Outside, the ancient landau of Don Santos Urique rattled to the door. The coachman ceased his bellowing. Senora Urique, in a voluminous gay gown of white lace and flying ribbons, leaned forward with a happy look in her great soft eyes. "Are you within, dear son?" she called, in the rippling Castilian. "Madre mia, yo vengo [mother, I come]," answered the young Don Francisco Urique. Add A Double-Dyed Deceiver to your own personal library.